What exactly is a black conservative, and why would anyone choose to be one? This question, deemed largely irrelevant in years past, is one that liberals can no longer afford to leave unanswered. While the 2006 midterm elections buoyed liberals, Democrats have in fact been losing ground with their African American base. In 1972, fewer than 10 percent of African Americans identified themselves as conservative; today nearly 30 percent-11.2 million-do. By contrast, the number of blacks who self-identify as liberal continues to decline, reaching a low of 13 percent in 2004. In this groundbreaking book, Bracey explains black conservatism’s growing appeal and traces its hidden and underappreciated history. Though black conservatives are becoming the most visible voices within African American politics and culture, few realize that the black conservative tradition predates the Civil War and is an intellectual movement with deep historical roots. Bracey takes his readers on a remarkable journey, tracing the evolution of black conservative thought from its origins in antebellum Christian evangelism and petty entrepreneurialism to its contemporary expression in policy debates over affirmative action, law enforcement practices, and the corrosive effects of urban African American artistic and cultural expression. Bracey examines black neoconservatives like Shelby Steele and John McWhorter and reveals the philosophies of prominent political conservatives such as Clarence Thomas, Colin Powell, and Condoleezza Rice. With a revealing chapter on the infotainment effect of Bill Cosby, Chris Rock, pundits, and bloggers, Bracey analyzes the tradeoffs made by conservatives-many of which raise serious questions about whether conservatives today are effectively protecting the interests of blacks. 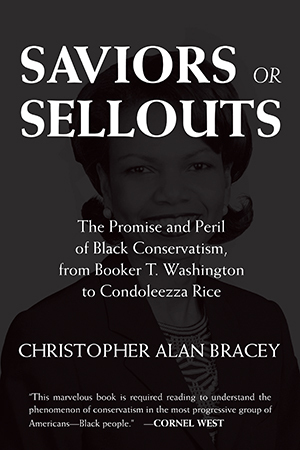 Original and penetrating, Saviors or Sellouts is the first account of why conservatism remains a coherent and compelling alternative for African Americans today.